Hello…It’s Adele! The London-native does not need an introduction, but certainly deserves one. With accolades including multiple Grammy Awards, Golden Globes, and an Academy Award, being named “Artist of the Year” by Billboard and being recognized as one of Time’s most influential people, Adele has become one of the most respected artists in the world. Inspired by legends such as the Spice Girls, Madonna, Etta James, Ella Fitzgerald and more, discover how Adele has chased her dream – from 19 to 21 to 25 – and found her own voice, soaring from hometown hero to global sensation. 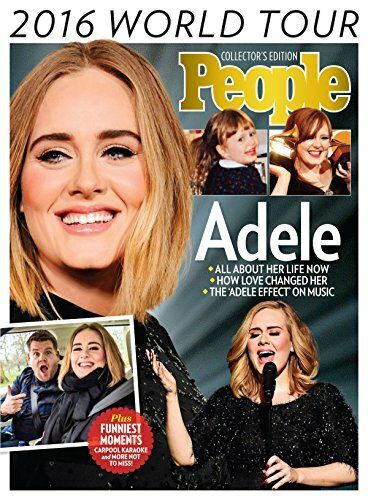 In the all-new, special collector’s edition from People, Adele: 2016 World Tour, discover how Adele rose to stardom – from Tottenham to the big stage. Get an exclusive inside peek at the summer’s hottest tour as well as a rare look inside her family, her style transformation, and the inspiration behind some of her greatest hits. With her heartwarming charm, natural sense of humor, and unparalleled talent, Adele is a one-woman showstopper that has changed the music industry and the world forever.